Today I introduced Coulomb’s Law in several of my classes. Every year when I get to this unit I waffle on whether or not to teach static electricity or jump directly into DC circuits. This year, I opted to do a little on static, focusing on Coulomb’s Law. 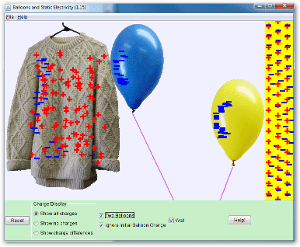 We did the Balloons & Static Electricity PhET simulation in class.